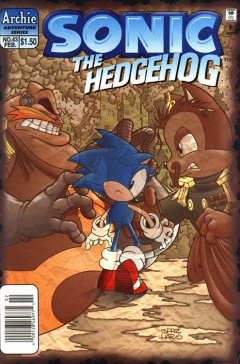 Sonic the Hedgehog 43 is the forty-third issue of the Sonic the Hedgehog comic. This comic features one story: "The Dream Zone". In the Knothole Village hospital, Sonic and Tails wait outside the ER, when Doctor Quack bursts through another door. Sonic tries to get some news from the doctor, but as he is in a rush, he tells Sonic to check in with his secretary for info. Wanting information now, Tails and Sonic decide to follow the physician, who rushes into the intensive care unit holding King Acorn. Sally Acorn, who is in the room, is pleased to see Doctor Quack, the doctor who delivered her when she was born. They share some pleasantries, then are lead over to Rotor, who has a new machine set up in the ward. Sonic is curious why he is there, not being a doctor, but Quack responds by saying he asked him to be there. They look over to the King, now fully crystallized except for half of his face, sitting in a chair on an elevated platform. Quack and Rotor want to use a cell regenerator to stop the crystal growth. With power rings and a Chaos Emerald already used to try and help the King, Sonic is sceptical if the regenerator will actually work. Even Quack is unsure, though he knows the crystallization is likely due to being exposed to something in the Zone of Silence. He already suggested sending the King back to revert him back to normal, but Sally is quite against that idea. While the two discuss the ethics of that idea, Sonic is curious if the King is aware of what is going on around him. Quack is unsure of that as well, instead, wanting to get the regenerator running. The group put on protective eye gear, as Rotor activates the cell regenerator. The chamber around the King lights up brightly, radiating him with energy. During the process, Sonic whispers to Sally, asking if they can trust the doctor. Despite trying to keep quiet, the doctor hears him, saying he'll ignore that statement, then asking Rotor for a progress report. He shuts down the machine, not noticing any change with the King's state. The doctor decides to wait it out and see if the regeneration will work later on. With nothing else to do, Quack prepares to leave, noting he'll have a nurse keep an eye on the King's condition. As he leaves, Sally asks if she can stay, which he believes is not a problem. In a flashback to the days of Mobotropolis, a young Sally and Sonic have a friendly argument in the castle. King Acorn walks over, wondering if there is a problem, but they ease his concerns by telling him they're just having fun. He lets the two run off to their treehouse, as Warlord Julian arrives in the room. Although Julian has some news for the King, the King turns the conversation around by telling Julian that there is a reception that night to announce his appointment as Minister of Science. He also notes that he has approved of Julian's plans to dismantle the Mobian military at once, secretly pleasing the Warlord, who crosses his fingers behind his back. Before the King leaves, he asks that Julian begin the process immediately. He walks out of the room, telling Julian that he'll see him that night. Julian, meanwhile, turns to his assistant, Snively, telling him to prepare the troops for his command. Later that day, Julian issues the command to Snively, activating his robotic troops' invasion of Mobotropolis. His SWATbots encounter little resistance, taking over the city easily. Sonic and Sally, elsewhere in the Kingdom, notice the troops, asking Julayla what they want. She can't explain the reason for the invasion, telling them to head to the palace with her to find Rosie. In the palace itself, King Acorn approaches Julian, demanding a reason for the mutiny. Julian declares that he has taken command of the kingdom, renaming it from Mobotropolis to Robotropolis, as well as that his SWATbots have struck the kingdom in many different areas. Four SWATbots surround the King, but he remains confident that Julian will be defeated. Julian then declares that he will no longer be called Julian, but rather Dr. Robotnik. He also tells the King that he will be banished to the Zone of Silence for all eternity...all the while, Julayla, Sonic and Sally watch from above on a catwalk. The flashback continues as King Acorn is brought to his knees by the SWATbots, kneeling before the now caped Robotnik. Although the King asks Robotnik about his lack of loyalty or responsibility, Robotnik mentions that he does have a responsibility; to bring chaos to order. Snively, aside, moves a curtain out of the way as Robotnik reveals his plans to bring chaos to order: the roboticizer. The King can only look on in shock as his citizens are roboticized right in front of him, obeying every order Robotnik gives. He calls Robotnik out as a monster, but Robotnik turns around, saying that, to him, the King is the enemy, and therefore, must be eliminated. The King maintains his stance, telling Robotnik that somebody will stop him, but that doesn't phase him. He orders the portal to the Zone of Silence to be opened, as the SWATbots throw him into it. "Long live the King". The flashback ends, causing the King to scream in pain. Sally gets scared, but Quack reaffirms her by saying that he's probably having a nightmare in an attempt to regain his memory. The more he struggles to remember his past, the more painful it likely is. This gives Quack an idea to show off his newest creation, the Electroencellographic memory inducer, a helmet like device, or for somebody like Sonic, the Dream Watcher. He explains that the Dream Watcher allows two parties to communicate with each other in a zone he calls the Dream Zone, but with one catch: if something goes wrong, the person who makes the journey could perish. He asks for volunteers, and, despite the risk, everybody does. Geoffrey offers to flip for it, leaving it between him and Sonic. He flips the coin, calling heads, but it lands on tails. Having won, Sonic rushes over a medical bed beside the King and prepares to be strapped in. Before he can, the doctor asks Sonic to fill out a waiver absolving the hospital and its staff from any responsibility. Sally yells at Quack, so he states it was just a joke. He walks over to the bed and straps Sonic to the machine, sending him into a deep sleep. The doctor's device works, sending Sonic into the King's past memories when he arrived in the Zone of Silence. The King instantly takes notice of him, wondering how he got there and how he found him. It takes Sonic a minute to get used to new environment, which is dreamlike, yet feels real. The King calls out to Sonic, asking if he was trapped by Robotnik as well, and how Sally is doing. He tells him that she is fine, but informs the King that they must leave at once. Before Sonic can explain the circumstances that have led him there, they are interrupted by the King's memories of Warlord Kodos. The large beast takes a swing at the King with his huge axe. Sonic, aside, wonders if, since the scene is simply a recreation of the King's memories, whether he should help or watch. Always being one of action, he rushes in, but is quickly stopped by a laser blast to his backside. He lands on a rock, as everybody looks up to see Feist, a large menacing panda bear with glowing eyes. Kodos and the King decide to end their disagreement in the meantime to focus on Feist. He orders the King and Kodos to remain silent, telling them to only respond when he asks them to, warning them that it would be best that they listen to him. Kodos doesn't take this lightly, as he jumps at the giant bear. Before he can get anywhere close to him, Feist lets out a powerful blast from his eyes, disintegrating Kodos easily. He focuses his attention next on the King, only giving Sonic a few moments to convince the King that everything he is seeing is a figment of his memory. He convinces the King that everything is from the past, and that, in reality, he has already been rescued. He remains sceptical, as he believes he is still in the Zone of Silence based on his memories. Sonic gives further details, mentioning about his crystallization. The King gets angry that such an event could happen, so Sonic quickly explains why they think he started to crystallize, from his exposure to the zone. He finishes off his explanation by telling about Doctor Quack's machine that brought him there. The King contemplates Sonic's words, as Feist disappears right in front of him, but he's curious why he can't recall being rescued. Sonic assumes the King lost his memory after his encounter with Feist in the Zone of Silence. Now in the know of what's going on, he asks Sonic for an update on what has happened since he was exiled. He tells the King about how Robotnik roboticized most of the citizens of Mobotropolis, and that some of them escaped into the Great Forest to set up Knothole Village. He then further explains how they have continued to fight Robotnik, but as he keeps coming up with new inventions, they can never deliver that fatal blow that is needed to stop him. He tries to convince the King that it is him that they need to lead their effort, to finally put an end to Robotnik, and to give Sally her father back. Despite being pessimistic before, the King finally believes Sonic, knowing he needs to come back, just as Sonic disappears from his mind. In the intensive care ward, Sonic wakes up, as does the King, who comes out of his blank gaze and starts muttering coherent phrases. As Sonic gets up from the bed, Rotor notes to Quack that the King's life signs have stabilized and that the crystallization has halted. Sally kisses Sonic for a job well done, while Geoffrey reluctantly congratulates him. With the King now on the mend, Quack and Rotor quickly roll his bed into the rehabilitation ward so he can fully recover. Tails, meanwhile, ask Sonic if he is alright, which he replies that life is the stuff that dreams are made out of. Doctor Quack is introduced, along with Feist. Kodos, although mentioned prior, is shown for the first time. Julayla is shown again, last seen in issue 18. Tails appears on the coin on the tails side, along with the text E. Pluribus Mobius. Roughly translated, it stands for "Out of many, Mobius", and, incorrectly, has a period after the E. This is based on the Latin phrase "E pluribus unum", found on the seal of the United States of America.